Col. Daniel Axtell, Captain of the Parliamentary Guard at the capital trial of King Charles I at Westminster Hall, 1649. 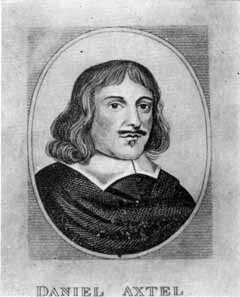 He was hanged, drawn, and quartered on 19 October 1660. Col. Axtell was the brother of the English-American Axtells' direct ancestor, Thomas Axtell of Sudbury, Massachusetts (so he's "Uncle Dan" to us). Thirteen officials were executed as regicides in 1660 and 1662 for their parts in the trial and execution of King Charles I. This picture appears in the 1945 Axtell Genealogy and the "Axtell Tercentenary, 1643-1943". The picture is captioned "from An Old Print". How many Regicides were there? -a brief explanation by Dan Axtell, webkeeper. Granagh Castle in Ireland, where there is a plaque that reads, "This ruin once the favourite residence of Máiréad Moore wife of Piers, 8th Earl of Ormonde. This Castle a 15th Century fortress was taken by assault by Cromwellian forces by Axtel in 1650."